This medium duty dehumidifier is a highly versatile and compact portable dryer, purpose built for water damage restoration it is impact resistant, robust with wheels for mobility and available in 110V or 240V. Capable of extracting up to twice the capacity of the BD70! 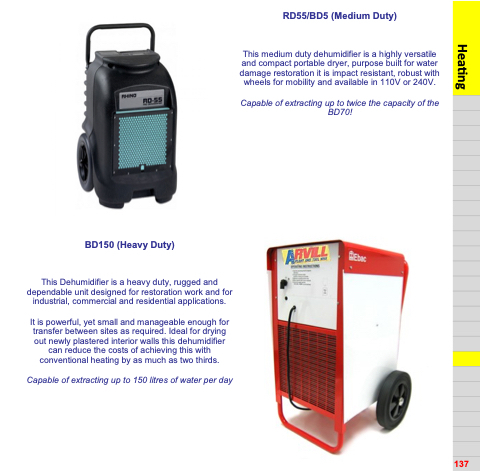 This Dehumidifier is a heavy duty, rugged and dependable unit designed for restoration work and for industrial, commercial and residential applications. It is powerful, yet small and manageable enough for transfer between sites as required. Ideal for drying out newly plastered interior walls this dehumidifier can reduce the costs of achieving this with conventional heating by as much as two thirds.